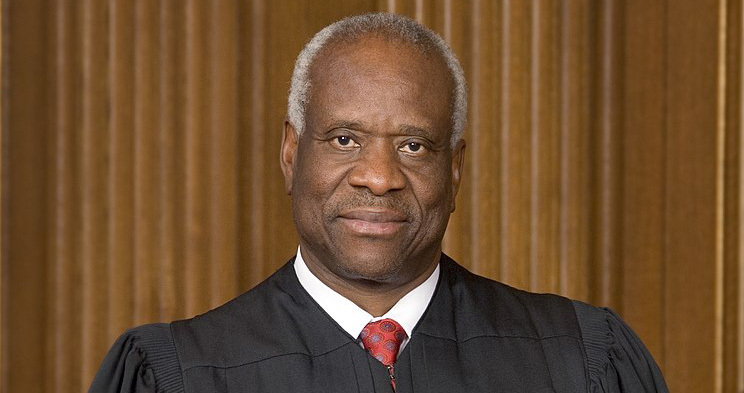 U.S. Supreme Court Justice Clarence Thomas surprised courtroom observers when he asked a question during oral arguments Wednesday in a case alleging repeated prosecutor bias in jury selection. Thomas asked about the race of jurors eliminated by the defense, report the Washington Post, the New York Times, USA Today, Reuters and a tweet by NPR journalist Nina Totenberg. Thomas last asked questions in February 2016 in a gun rights case. He ended up writing a dissent that claimed that the majority was relegating the Second Amendment to a second-class right. In the new case, a prosecutor used peremptory challenges to exclude 41 out of 42 potential black jurors in six trials of an accused quadruple murderer who is also black. In the sixth and last trial of Mississippi inmate Curtis Flowers, the prosecutor accepted the first qualified black juror and struck five others. At issue is whether courts should consider the history of the case when evaluating the new claim of bias in jury selection. Thomas asked whether the defense had eliminated any jurors. Flowers’ lawyer, Sheri Lynn Johnson, answered in the affirmative. Thomas then asked about the race of the jurors. The defense struck white jurors, Johnson said. Justice Sonia Sotomayor noted there were no potential black jurors left to strike because the prosecution had removed them all. Justice Samuel A. Alito Jr. appeared most likely to side with Mississippi’s argument that the prosecutor had good reason to strike the black jurors in Flower’s sixth trial, according to the Washington Post and USA Today.